Let yourself be seduced by the fascinating kingdom of the Hashemites. Visit magical Amman, and be amazed by the Greco-Roman city of Jerash and see the Castle of Ajloun. Cross the desert of Wadi Rum in a 4x4 and relax as you float on the waters of the Dead Sea, the lowest point of the earth. Admire the ancient wonders of Petra, one of the seven wonders of the modern world. International flights U.S. - Amman - U.S.
*Mazayen Camp with a private bathroom. ** If you arrive late on day 2, dinner will not be included and the total number of dinners will be 6 instead of 7. Breakfast on the last day is included if your return flight is after 11:00 in the morning. It is possible that your return flight will be in the early hours of the morning, in which case, breakfast on the last day will not be included. The order of the itinerary may change depending on the departure day. The possibility of upgrading to full-board with lunches is available in the next step of the booking process. Passport details are necessary to obtain a free visa. It is mandatory to send a copy of the valid passports of all passengers to customers@exoticca.com once you have made your reservation. 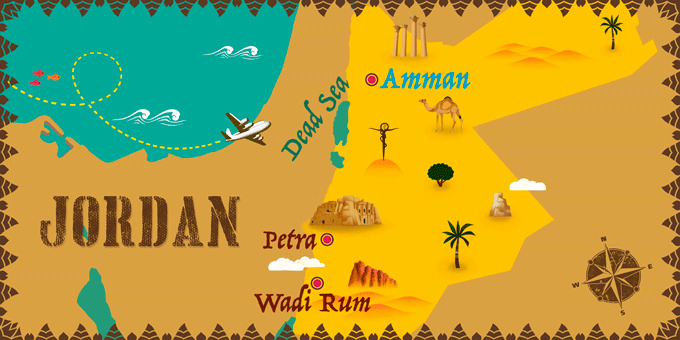 Arrive at your U.S. departure airport to board a flight to Amman. Night on board. Arrive at Amman Airport in the early morning and transfer to your hotel. * Amman is the modern capital of Jordan but possesses dozens of ancient historical sites, all set in the north of Jordan on a hillside. Dinner and overnight stay in Amman. *Possibility of booking early check-in in the next step of the booking process. Breakfast at the hotel. Enjoy a panoramic visit to the city of Amman. See its most important streets, the Ciudadela, and the urban center. Next, continue north to Jerash, one of the cities of Decapolis. See the Arc de Triomphe, the Oval Square, the Cardo, the Colonnade, the Temple of Aphrodite and finally, the Roman Theater, which is famed for its wonderful acoustics. Move on to visit Ajloun Castle, a fortress built in 1185 and rebuilt in the 13th century by the Mamluks after their destruction by the Mongols. This castle, from the time of the Crusaders, is located at the top of the mountain so be sure to enjoy the beautiful panoramic views. Return to Amman, dinner and overnight stay. Breakfast at the hotel. Depart to the east of the city, to visit some of the most astounding Desert Castles: These castles, constructed from the seventh to the eleventh centuries, were used as Caravans, others as rest pavilions and some of them as military forts for the defence of the territory. Next, get ready to visit the amazing Dead Sea. The lowest point on earth, located 400 meters below sea level. It is famed for its high salt content, so if you have the opportunity to bathe in the waters you will be amazed by how buoyant the waters are. Return to Amman for dinner and an overnight stay. Breakfast at the hotel. Set off for Madaba to visit the Church of San Jorge where you can admire a mosaic made in the year 560, which represents the oldest known map of the Holy Land. Continue towards Mount Nebo, the place where Moses is thought to have the first sighting of "The Promised Land". Enjoy a wonderful panoramic view of the Jordan Valley and the Dead Sea and visit the remains of the Byzantine Church with its beautiful mosaics. Head to Shobak Castle, located on the side of a mountain, it was built by King Baudouin I of Jerusalem to keep watch over the route between Egypt and Damascus. Arrival in iconic Petra, for dinner and an overnight stay. Breakfast at the hotel. Spend a full day visiting the famed Nabatean capital of Petra. During the visit tour the most important and representative monuments sculpted in the rock by this ancient civilization. Admire the Treasury, the famous and most internationally recognised monument, as seen in one of the Indiana Jones films, the Colored Tombs and the Royal Tombs, and get to know more about life here in ancient times. Petra is one of those places in the world that you must visit at least once in your life. At the end of the visit, in the afternoon, return to the hotel. Dinner and overnight stay in Petra. Breakfast at the hotel. Head off to a place known as "Little Petra", located north of Petra. A narrow gorge of 6ft. wide adorned with typical Nabatean architecture makes this visit unique and incomparable. It was inhabited by the Nabateans and has many tombs, water tanks and riverbeds. Next, head to Wadi Rum, the desert made famous by Lawrence of Arabia. Take a 4x4 excursion on the lunar-like landscape for an unforgettable experience. Dinner under the stars and overnight at the camp in Wadi Rum. Breakfast at the camp. At the indicated time, return to Amman and spend the rest of the day at your leisure, soaking up the culture and atmosphere. Dinner and an overnight stay in Amman. Breakfast at the hotel. * At the indicated time, transfer to the airport for your flight back to the U.S. Overnight flight. *It is possible that your flight will be in the early hours of the morning, in which case, breakfast will not be included. * If you arrive late on day 2, dinner will not be included and the total number of dinners will be 6 instead of 7. Breakfast on the last day is included if your return flight is after 11:00 in the morning. It is possible that your return flight will be in the early hours of the morning, in which case, breakfast on the last day will not be included. The order of the itinerary may change depending on the departure day. The possibility of upgrading to full-board with lunches is available in the next step of the booking process. Passport details are necessary to obtain a free visa. A copy of the passport of all travellers must be sent to customerservice@exoticca.com once your reservation is complete. Arrive at your U.S. departure airport to board a flight to Amman. Overnight flight.